Published April 2, 2019 By Anna T. This post may contain affiliate links. Regardless, I only recommend sites I've researched and/or used and trust. 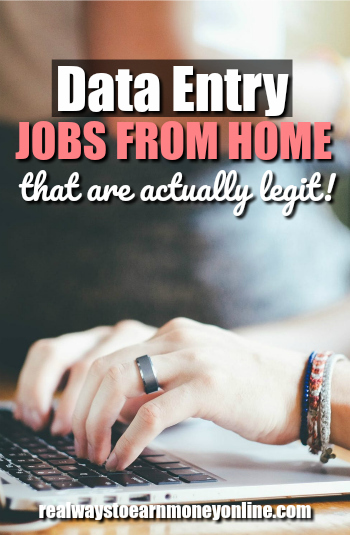 Are you looking for data entry jobs from home? Then you are in the right place. It's the first thing most people look for when beginning their home job search, and it's the first thing I looked for, too. We want to do data entry because it's non-phone and sounds so easy! Below are links to legit, researched data entry work from home without registration fees, plus good job search sites and basic info on the work and what it involves. By the way – If you like this kind of info, be sure to become a subscriber. You'll get new work at home job leads in your inbox twice a week. #1 – Cass Information Systems – Data verification and data entry. This position is very location-based. If the position is available, you'll see it listed as “Data Verification Clerk.” You have to train onsite for a few weeks before you can do the job from home. Their BBB rating is A+. #2 – Ibotta – This company occasionally has a data entry position open, but it's for Colorado residents only. So if you're in Colorado, be sure to keep tabs on their “Jobs” page to see if they're hiring for data entry. Pays $10 hourly and is part-time when open. Ibotta has a B rating on the BBB. #3 – The Smart Crowd – Read The Smart Crowd Review – Very low pay. Must take a typing test to get hired and pass with good accuracy. Really just good for extra money here and there. This company offers part-time online data entry jobs, as there is typically not enough work to do this full-time. #4 – Dion Data – Read Dion Data Review – A legit company that has been around for years. Unfortunately I don't think they actively hire that often. #5 – DataTrace (formerly known as RedVision) – This company occasionally has work at home data entry jobs posted. #6 – Smart Locating – Frequently (but not always) advertising data entry work on Craigslist. Usually states you need to be able to meet for face-to-face meeting first. They are based in Texas, so you will likely need to be near one of their locations so you can meet with them. This company appears to have A rating on the BBB. #7 – Xerox – Read Xerox Review – The job is usually location-based, requiring that you work on site for one week before being allowed to do the job from home. Visit their Careers page and type in “work from home data entry” in the keywords box “transaction processor” to see if this position is available. #8 – Freelance bidding sites – These almost always have data entry opportunities listed that you can bid on to do. #9 – Amazon MTurk – Read Amazon Mechanical Turk Review – You can find short tasks here on occasion that involve keying and typing, but you will have to do a search for them. #10 – Clickworker – Read Clickworker Review – A short task site similar to MTurk (above) with similar tasks. #11 – TTEC – Read TTEC Review – While this company is most known for phone work from home, they sometimes have data entry jobs available. When open, it's typically part-time and entry-level, paying around $10 an hour. They will usually only be hiring from specific states. If you don't see the job posted, be sure to check back later. I am always looking for more legit work at home data entry jobs, and I tend to go back and update old posts regularly, so if I find more, I will link them here. Online Data Entry Jobs – My Favorite Job Boards to Search! Sometimes you'll be able to find data entry opportunities when you search major job boards. It's a good idea to check these daily since the listings change constantly. #1 – Indeed – Read each description carefully to check if the opportunities you find on Indeed are work from home — many are not. Indeed is good at weeding out scams, but you still may find a few so be careful. #2 – FlexJobs – There is a fee to access the job postings on this site, but it's one of my favorite ones to search since they screen for scams prior to posting (not all job boards can claim this). They also have a dedicated category for data entry. It's probably your best bet for finding legit work at home data entry jobs online. I've paid the fee for months now and continue to find little gems when I search in there. It's $14.95 to access their listings, but you can use promo code AFFILPROMO to get up to 30 percent off your membership fee. #3 – Craigslist/Adhuntr – I use a site called Adhuntr to search all of Craigslist. Unfortunately there are many more scams on Craigslist than there are legitimate online data entry jobs, so be careful what you apply for. The duties of a data entry clerk will vary a little depending on who you're doing the work for, but in general you are transferring data from one source to another. Usually, you'll be looking at data — either on paper or on a computer screen — and typing it out into either a form or spreadsheet. Even though data entry jobs from home sound fun and easy, it can actually become extremely boring and monotonous. Not everyone is cut out for it. This line of work is not known for paying well as far as work at home jobs go. Most of the work at home data entry jobs I find pay minimum wage or less. They can legally do this if you're working as an independent contractor, and in most cases, you will be. According to the Bureau of Labor statistics, most data entry keyers earn about $15 hourly. However, I believe this data is more in line with what this work pays when you're doing it onsite. As stated above, most of the data entry jobs I find that are work at home do not pay much at all. Most of the companies with work at home data entry jobs are not going to just hire you without first testing your skills, so be prepared to be tested. You need to be not only a fast typist, but also an accurate typist. Even if you are neither fast nor accurate with your typing, these are skills you can work on. Keybr has a good online tool you can use for typing practice to help you get faster. Work at home data entry jobs aren't usually going to require equipment you don't already have. At minimum, you'll need an up to date computer with high speed internet. Some — but not all — companies will either require or recommend that you use dual monitors. If you're wondering why in the world you'd need something like dual monitors for data entry, it's because it can greatly simplify the transfer of information from one document to another. If you have two monitors side by side you can look at, you will not need to be clicking back and forth between various open tabs on your computer. This is a major time-saver. And because data entry work is usually pay per piece, you'll want the tools that make it possible for you to go as fast as you can. These are the typical red flags for work at home scam sites. Watch out for these on any site you use to search for online data entry jobs, but in particular watch out for them on Craigslist! Claims you'll make a lot of money. That's not typical for data entry. I'm a little skeptical of any data entry listings promising much more than $10 hourly. If the ad states you'll make hundreds or thousands each week, don't even look at it. No skills required. Scammers usually don't list that you need any skills because they want to make sure many people will attempt to apply. If there are skills listed, you'll notice they're usually very basic skills most anyone would likely have. An example might be something like being able to type 25-35 wpm — most people can do that. Any sort of fee. There are some instances where a fee for a work at home job is a legit thing, but it's rare. The jobs listed on this page are free data entry jobs. Anything that isn't free is probably a scam. Avoid any listings where you're asked to pay for training, membership, software, etc. No company name or contact info. If you can't research the company that posted the ad, just stay away to be on the safe side. Poorly designed or brand new website. Scammers often throw fake websites together to fool people, and they usually don't take time to ensure they're nicely designed. You can see how recently a website was created by visiting whois.net and putting in the website address. A website that was just thrown together and created a few days or weeks ago equals a red flag for a work from home scam. A request for you to deposit a check for business supplies into your own account. This might sound strange, but it's rampant. Work at home scammers will “hire” you, typically via a chat session on Google Hangouts or Skype, and then tell you that before you can begin work, you must accept a check from them for your business supplies. They will ask you to deposit the whole thing and then wire them back a portion of what they sent you. The check will be fraudulent and you will be liable for the wired money. The scammers will be long gone! There is more info on this scam here. If you think you've already fallen victim to a work at home data entry scam, you can and should report it here with the FTC. Is Data Entry Not For You? Have you read this page and decided that perhaps this industry isn't for you? This is understandable. It's hard to find openings and even if you do, you won't make much money. A higher-paying option that also has more demand is transcription work from home. This is similar to data entry in that it involves typing work, but instead of typing out data you see, you're typing out data you hear. Transcription is also a field where you CAN get started with no past experience. We have a huge list of transcription jobs and companies. Many companies are hiring for this! I also have a list of typing work at home jobs here that will help you make money putting your typing skills to use (legitimately of course). Post originally published on September 12, 2014. Updated and republished on April 2, 2019. Thanks for valid informations,great work. Cheryl, where do you do chat hostessing thru? I’m sorry to be the downer on this sort of work because data entry was what I did in the corporate world for eleven years with at a local bank and 4 years for another non-bank company. Virtual Bee in my opinion is not worth the time. It’s worse than slave wages unless you can type 90+ wpm and it’s still bad pay. A side job maybe for a gumball from the local store’s gumball machine. lol Dion Data I have never heard of anyone getting hired by them. I had a perfect resume and eleven plus years of data entry under my belt with impeccable references and still couldn’t get hired by them. Axion Data I have heard about for years and again never heard of anyone getting hired by them. I tried a few times myself and nothing ever happened. As far as bidding on data entry work you end up working for peanuts because someone will always bid to do the job less than you so the pay ends up to be worse than Virtual Bee. I don’t mean to be a big downer when it comes to data entry work from home but in my opinion you would be better off looking in a different line of work. I’ve done chat hostess jobs and made $15 an hour and could work any hours I wanted to. My opinion is a decent work from home data entry job just doesn’t exist. Where did you chat host through? Cheryl, great post thank you but I am with Kelsie, where do you get a chat hosting job then?